Having made the Carrot Parsnip Latkes yesterday for Passover, I had some extra grated carrots leftover so I decided to look through my pantry to see what else I could make with them. 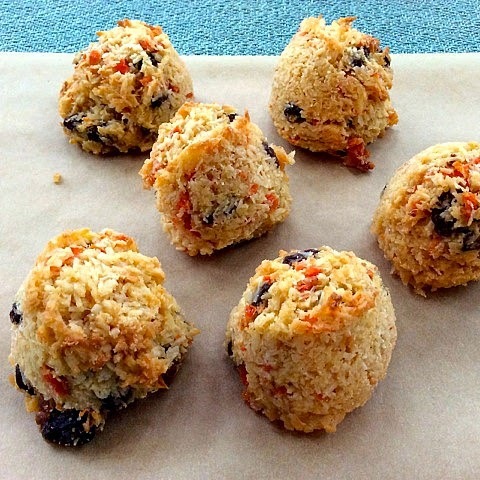 In the spirit of Passover and the upcoming Easter Holiday I decided to make these super easy Carrot Coconut Gluten and Dairy Free Macaroons. Hope you enjoy these as much as I did! Roll into 24 balls approximately 1 inch in diameter and bake for 30 minutes. Oh wow, these look great! I love the combination of coconut, carrot and orange. Will have to make these when I get some more coconut flour!